Logan Harper’s motto – stay away from people and you won’t get hurt. He has a successful business, his family, and a few casual friends. That’s more than enough to keep him happy. When Jayna McIntyre comes to town seeking out the Harper family, Logan is the one who comes to her rescue. What harm could come from helping a single mom? He’s an expert at knowing how to keep other people’s drama from invading his life, so helping her and sending her on her way should be easy. This is the first book by collaborative team JJ & TA Ellis that I have read, and I was pleased to discover that it was a well-thought out, entertaining and enjoyable read. The characters are well-fleshed out and likeable, and the story follows Logan Harper and his interactions with Jayna, a young, pregnant woman on the run from an abusive partner who is the father of her child. Logan, for his own reasons, has given up on love and finds himself in the difficult position of being attracted to Jayna and wanting to help her, but determined not to get too close. 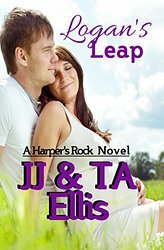 Through a series of events, Harper finds himself becoming more involved with Jayna and her baby boy, and while he admits to love for baby CJ, he struggles to name the emotions he feels for Jayna. Add into the plot a vengeful ex-boyfriend, the boyfriend’s villainous henchmen and Logan’s loving but flawed family, and you have an enjoyable read which is perfect for wiling away a couple of hours. The book is well-fleshed out; although the authors suggest it is suitable to be read as a stand-alone novel, I would suggest reading the books in order. Having not read the first book in the series, there were a couple of minor moments during reading where I felt like I was missing some tiny pieces of the puzzle, particularly the intricacies of the relationships between the Harpers’ and their extended family. There were some minor typo issues throughout the story, but not enough to detract from the enjoyment of reading. Overall, I’d give it a solid four and a half stars, but given that Amazon don’t deal with halves, I’m rounding up. Definitely recommended for those people who love a good romance, enjoy the friendly nature of living in a country town, and books which follow extended families with all their idiosyncrasies. I will certainly be reading more of JJ & TA Ellis’s books and intend to start on another one of their books from my TBR pile next.